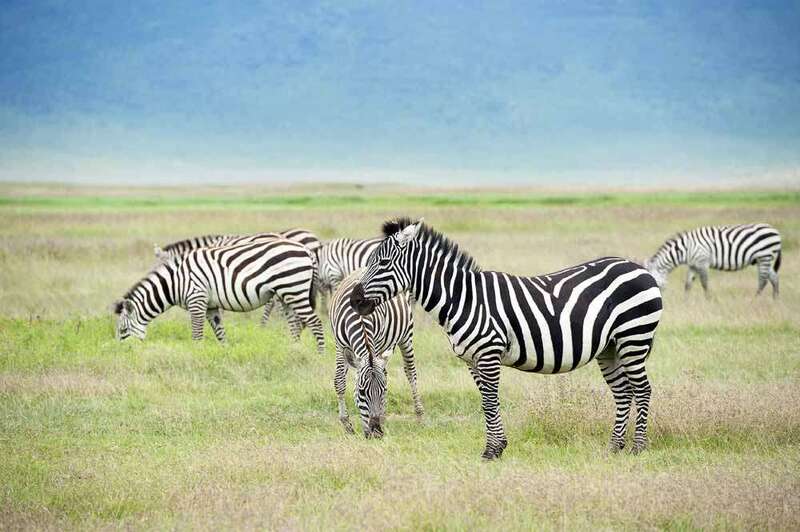 The Ngorongoro crater in Tanzania must surely vye to be one of the Seven Wonders of the World with its unparalleled vistas and wildlife – a stunning and truly remarkable experience for any lover of nature. 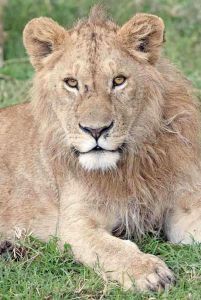 This, our first review, deals with the natural wonders of the crater, whilst our second part suggests some fascinating places to stay nearby. 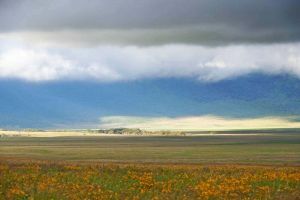 Our first sight of the Ngorongoro Crater follows a dark and cloudy night on its rim, with us eagerly anticipating what we will see in the morning. 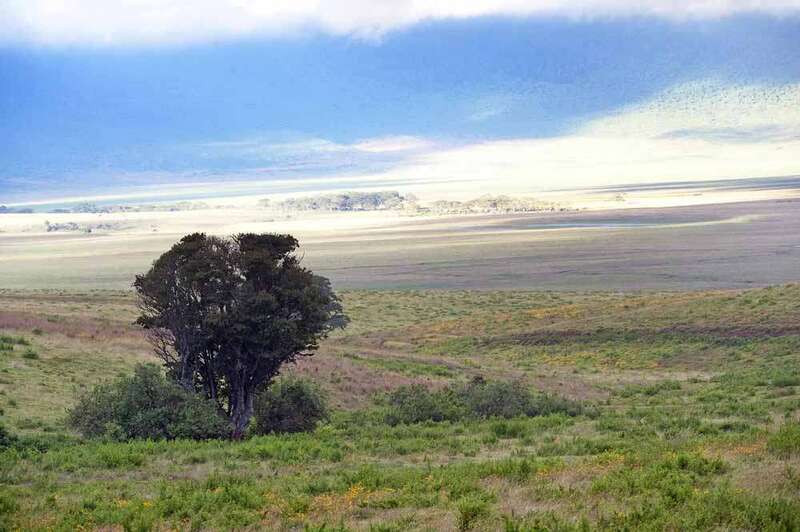 Fog, inversions and cloud can all mar the initial early-morning experience, if you’re unlucky, in what is the largest unbroken and unfilled extinct volcano caldera in the world. 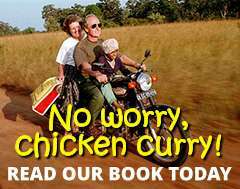 We needn’t have worried. Initially we arise into cloudy, misty and damp surroundings and our moods match the gloom. 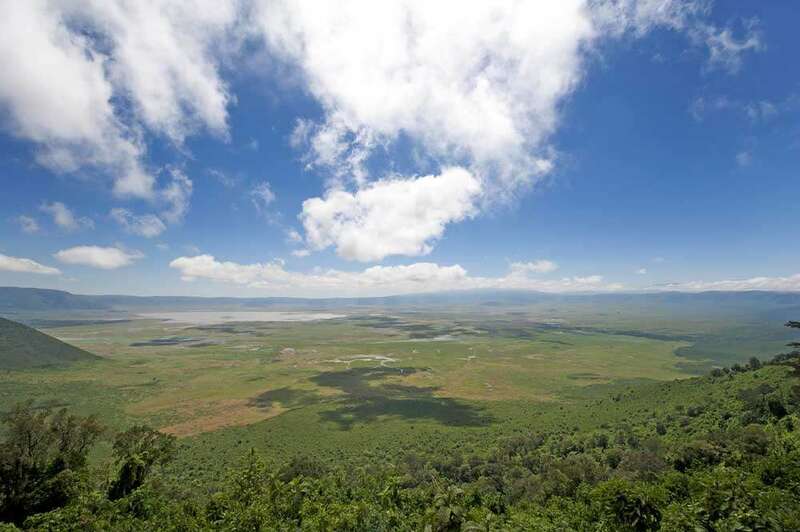 We wrap up warmly and climb into our 4×4 anticipating a chilly descent over the crater rim. Although the crater rim is shrouded in cloud, as we gradually descend the rocky track, the mist gradually clears to reveal the magnificent extent of this incredible natural wonder. At 2,000ft deep and 100 sq mls in area, it’s difficult to explain the sheer magnitude of the sight before us as the sun creates a kaleidoscope of colour within the landscape and the rising mist. 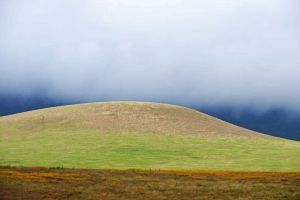 The varied landscape itself is sufficiently awe inspiring to make a visit to the crater well worthwhile and we stop frequently to photograph the light effects that are created as the sun’s light is diffused throughout the scenery before us; casting ever changing hues onto the grassland and forest. The landscape is largely montane forest on the crater sides, with naturally occurring fresh and saltwater lakes on its floor, fed by springs and rivers that punctuate the extensive grasslands. We’re here in May and being low season we’re the only vehicle at the moment, with no others in sight and we bathe in the pleasure of isolation and are lost for words as we simply absorb our expansive surroundings. Later, there may be up to a hundred vehicles at any one time in the park but throughout our time here it appears to be well managed. No crackle of radios disturbs your viewing, which also means that if you discover animals then you’ll mostly have them to yourself; rather than sharing with a crowd of noisy tourists who have been summoned from throughout the area by walkie-talkie. You can spend all day in the park, taking a picnic with you and you’re unlikely to see more than a handful of vehicles at one time unless you go to one of the designated picnic spots. 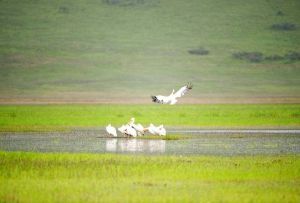 Ngorongoro is a truly natural experience. 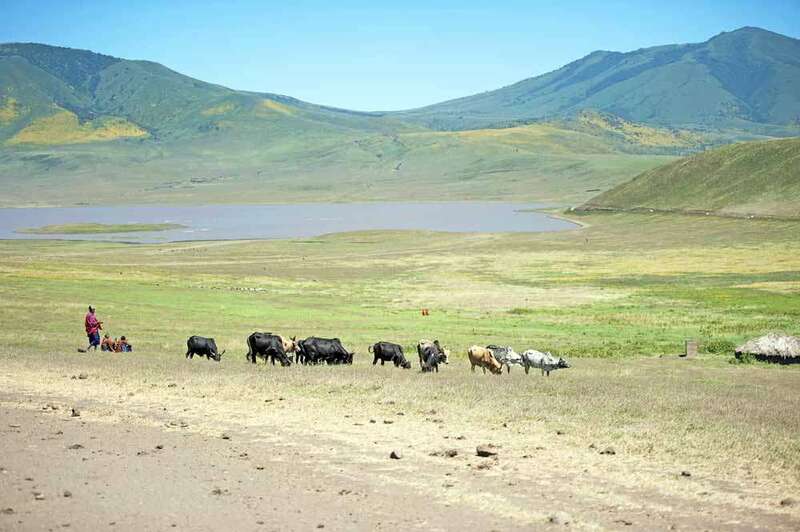 Maasai tribal people still graze their cattle during the daytime and wild animals graze and hunt in what to all intents and purposes is a captive arena of nature. The scene can hardly have changed in two thousand years. 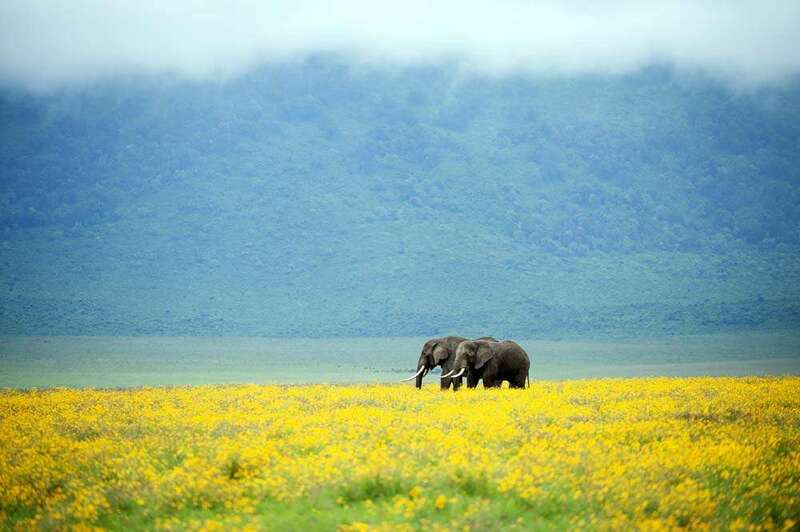 – or a pair of male elephants amidst a sea of yellow bidens and aspilia flowers that only bloom after extended rains, such as those experienced this year. 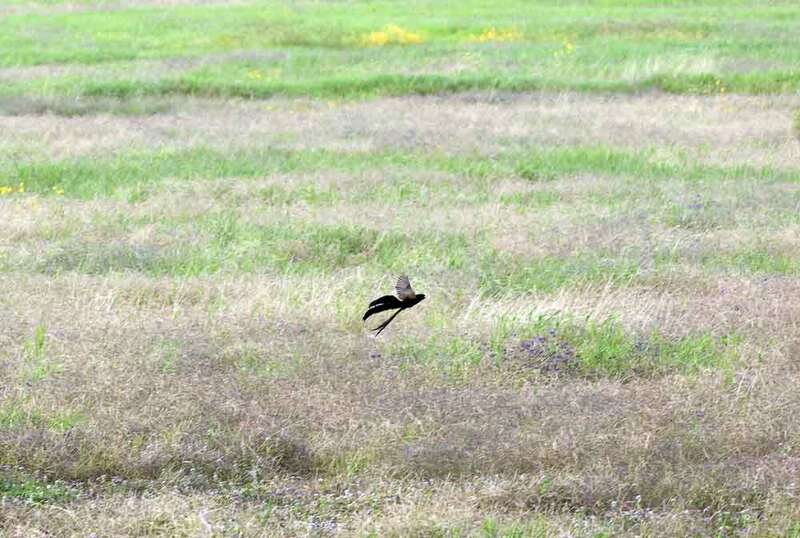 A Jackson’s Widow bird creates an amusing dance in front of us as it displays to attract a mate. These sights are magical and it’s hard not to wax lyrical about the crater being a real Garden of Eden. 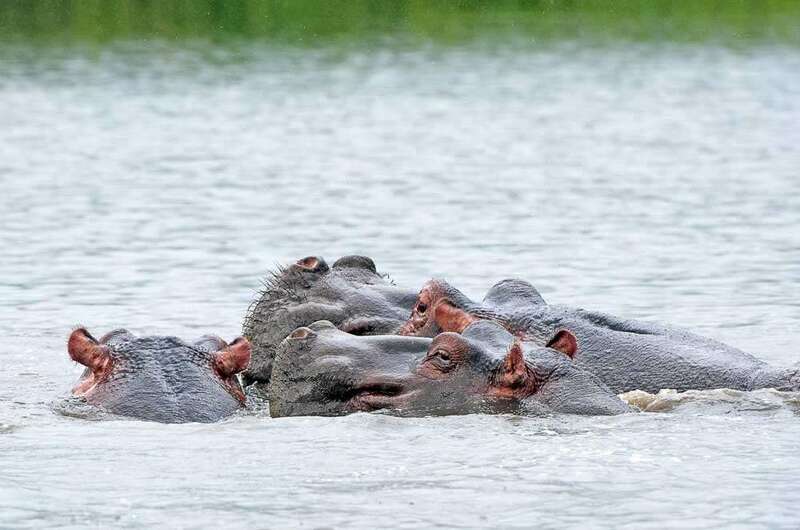 Most of Africa’s well-known wildlife is here, with the notable exception of Giraffe for some reason and whilst it is plentiful, we never have the feeling that we’re in a confined area that doesn’t require vigilance and patience to see the best of it. Patches of woodland, rocky outcrops, dusty plains, wetland habitat and long grasses are all to be found in this diverse area and the rewards are plentiful for anyone interested in the natural world. 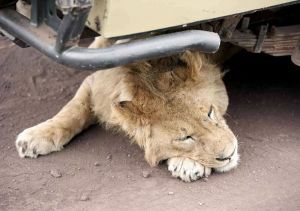 As with most parks in Tanzania, self-drive is possible but not always practical. Even with satnav these days it’s easy to get lost amidst the maze of tracks in Ngorongoro – even though you’d think it straightforward in such a ‘confined’ space. Throughout Tanzania, signposts are at a premium. Especially within national parks – so it’s one place we’d suggest that you utilise experienced guides rather than go it alone. 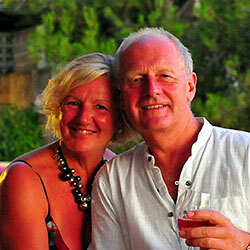 There’s no rush to our visit and it’s a pleasure to take our time at any location to simply soak up our surroundings. 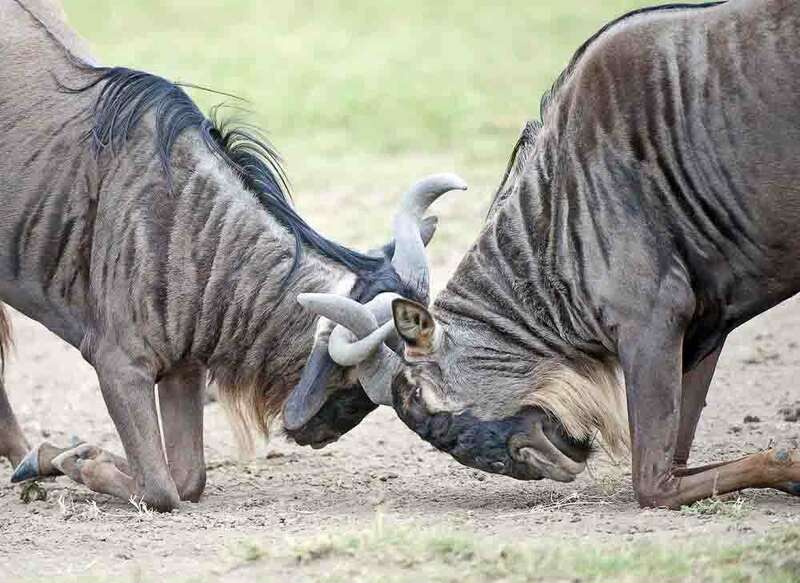 We see Wildebeest, horns locked, fighting; hippos wallowing, Crowned Cranes gathering their chicks together and Pelicans planing onto the lake surfaces. 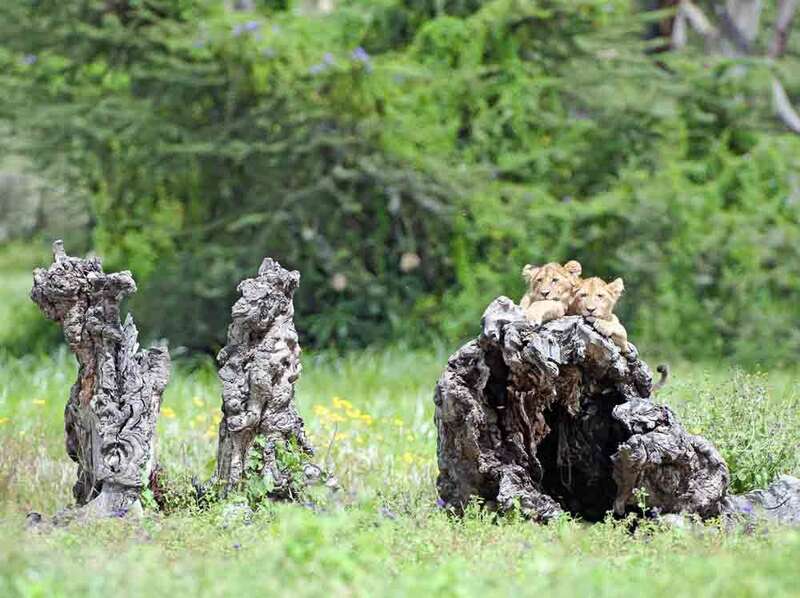 Lion cubs create a fetching picture as they sit on a tree stump awaiting the return of their mother. 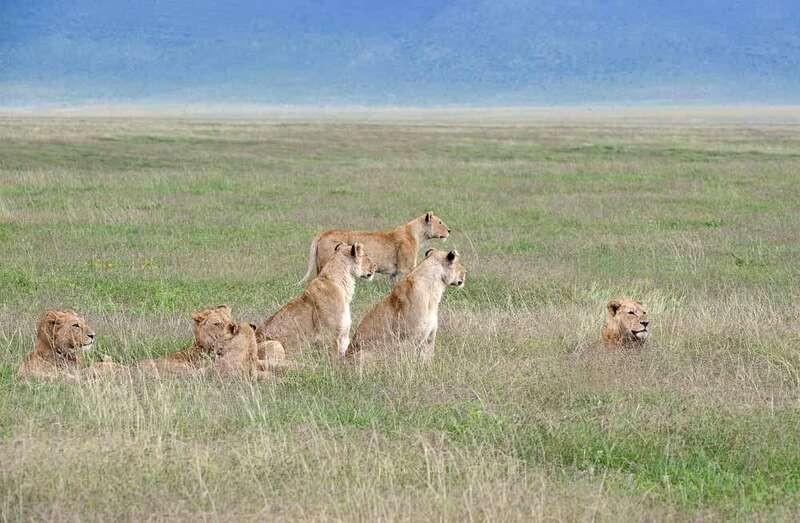 Lion families are plentiful (Ngorongoro having the most dense population of East African Lions, believed to number over 50) and they’re surprisingly habituated to the presence of vehicles. One even strolls over to an adjacent vehicle and slumps down under its chassis for shade. 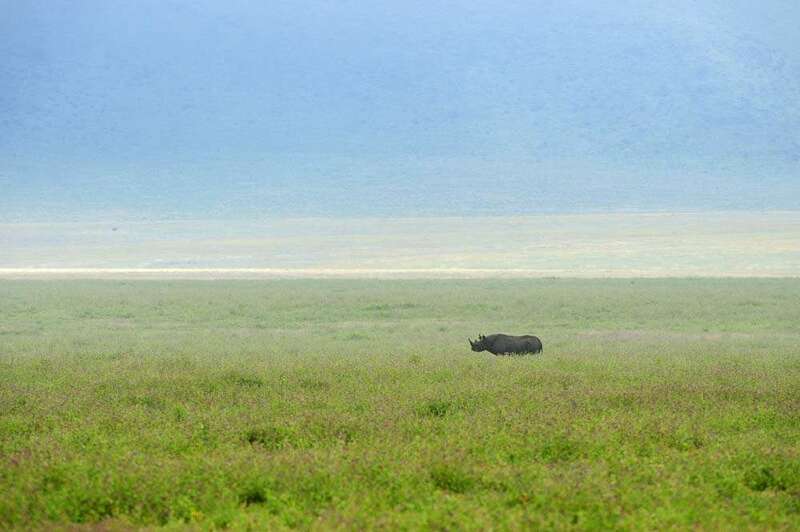 The crater is part of the larger Ngorongoro Conservation Area (NCA) and the neighbouring Serengeti National Park. 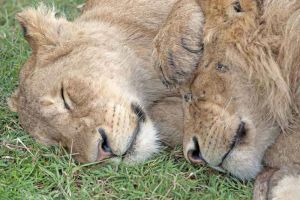 The NCA offers a more pastoral but equally as interesting scenery with several Maasai villages on the outer crater slopes and its wildlife, by comparison, is part of the great migration from the Serengeti each year into Kenya’s Masai Mara. The Ngorongoro has been, for us, the stuff of dreams – a name that has forever been on our radar for a visit since we were young – but unlike so many dreams, this one has materialised to fulfill and exceed our most ambitious expectations. Although not exempt, this natural enclosure has managed to escape many of the pressures experienced by other national parks throughout the world – that of the tourist dollar. This might be partly due to the roughly $300 you’ll spend to get a car and yourselves into it for a day but it’s probably more down to the fact that Ngorongoro is relatively well managed and not too accessible. We just hope that the increasing global bow wave of enthusiasm to preserve our natural world is not swamped by the inexorable lure of income, as it has been in so many other places – where we kill the goose that lays the golden egg. Ngorongoro is an experience you’ll never forget if you’re a lover of the great outdoors and all things natural. 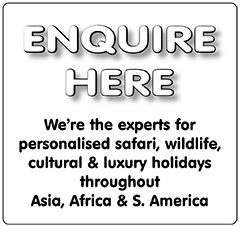 Our next review offers you a choice of excellent accommodation that truly complements the overall experience, to give you a fully rounded adventure in one of the earth’s few remaining natural wonders. Ngorongoro is good to visit at any time of year – so it depends on what you wish to see and under what conditions. The best weather will be experienced from June to October, with the greatest crowds from July – March. Grasses are shortest in this period so wildlife – and tourist life – is easier to spot! 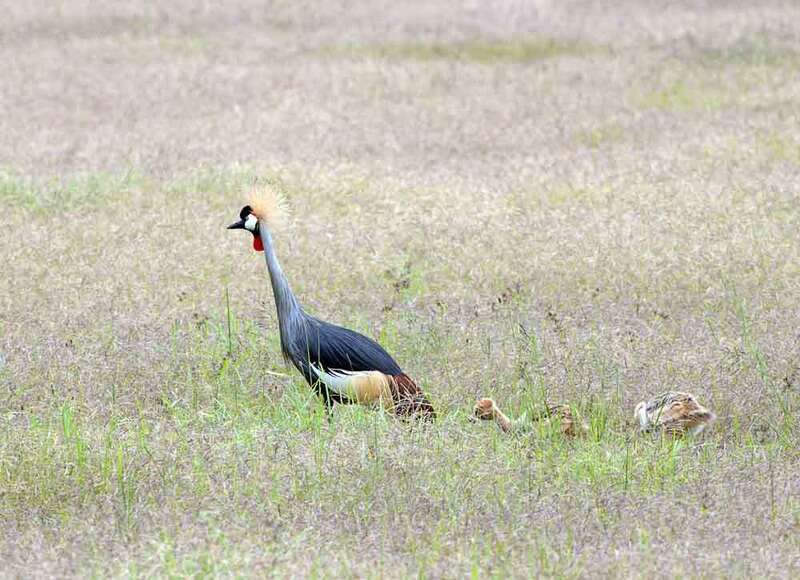 Rain is virtually non-existent, sun plentiful and risk of malaria is at its lowest..
March – May is the peak of the wet season, which might disrupt your access to certain areas of the crater but rainfall is usually in short sharp squalls. This period should also afford you better accommodation rates and fewer crowds. 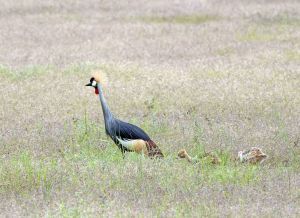 Migratory birdlife is at its peak during this period. Nights and early mornings are generally chilly throughout the year – so take layers.